Movie Review: Static and minimalist on visuals, and expeditious in words, “Locke” is a one-man drama, totally set in the streets of England inside of a car. 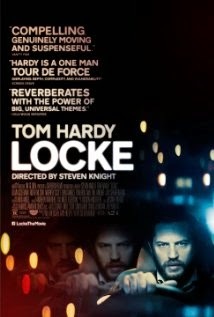 While travelling from Birmingham to London, successful construction foreman Ivan Locke (Tom Hardy) engages in a sequence of serious phone calls. Assuming a compromising mistake in the recent past, he just made the most courageous decision in life, putting at stake his family, his career, and his own mental state. Evincing an admirable cold-blood within a stressful situation, he tries to control himself and simultaneously calm down his wife, his partner who will have to prepare everything alone for the next fundamental day at work, his demanded boss, and the future mother of his new child who is about to be born. Director/screenwriter Steven Knight (“Redemption”) presents us an original and bold concept in his directorial sophomore feature film, unexpectedly creating tension through the conversations we witness. Certainly this won’t be a film for those who are searching for thrilling action moments or mysterious plots, since “Locke” lives much from Tom Hardy’s memorable performance and from what the viewers feel by putting themselves in his place. In the scarce moments in which he doesn’t talk to anyone, he imagines conversations with his deceased father, a fact that shows his despair and loneliness. The low budgeted “Locke” takes us purposely to commonplaces in terms of visuals, but even contrived, captivated my attention with its simple story of a man’s downfall.